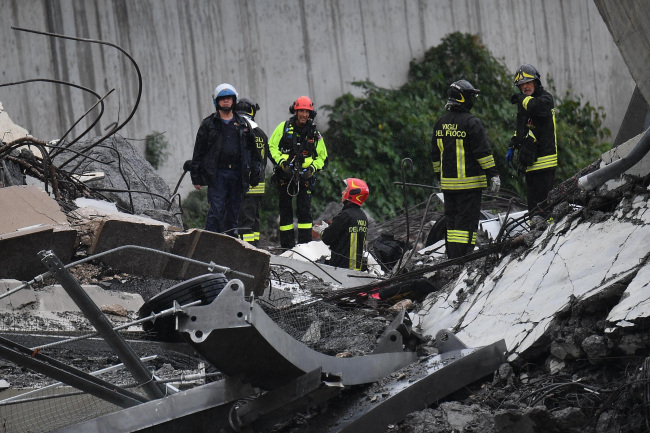 MILAN (AP) -- A bridge over an industrial area in the Italian city of Genova partially collapsed during a sudden and violent storm on Tuesday, leaving vehicles crushed in the rubble below. Video captured the sound of a man screaming: “Oh god, oh, god.” Other images showed a green truck that had stopped just meters (yards) short of the gaping hole in the bridge. “We are following minute by minute the situation for the bridge collapse in Genoa,” Salvini said on Twitter.